Not a simple story, (and not required reading, either). But, people do ask. 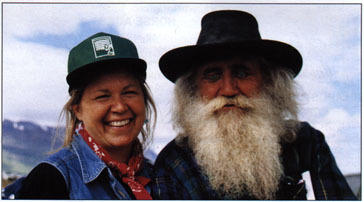 After riding on a horse tour in the South for a week, Holly and Brad caught the last few days of Landsmot July of '98. Cafe Yasmina is just behind the edge of the dune, center left on the photo, fine service, excellent food, bring your own wine.Holly is working her way up to the top of the dune, to watch a beautiful sunset this evening. We had watched a beautiful sunrise this morning at Merzouga, then rode our horses north along an old caravan trail, reaching Cafe Yasmina in the early evening. Everyone on the trip had a great time and decided to consider another trip. The next trip was to Iceland. We discovered Icelandic horses. 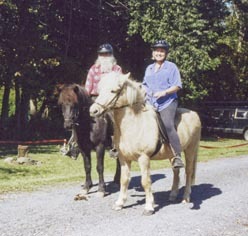 And realized what horse back riding treks on gaited horses could be like. Holly, her first group in Iceland, 1975. We've looked at a lot of places, with and without horses; canal boats in Ireland, sailing in the Aegean. Other lands; Estonia, Finland, Ireland, etc..etc. We keep coming back to Iceland. The horses and the riding and the landscapes are certainly unique. The travel industry has started to mature there lately, but we believe that Disneyland Iceland is very far in the future, and the little bit of slickness slipping in at the edges is more than offset by those aspects of travel and exploration that may never get polished up for the masses. When you call about going on a tour you'll talk to one of us, Holly or Brad, who have spent a lot of time in Iceland. 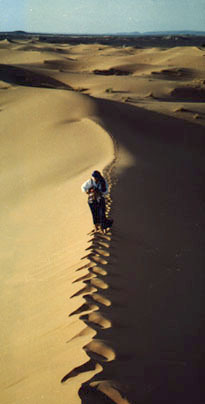 You can get a lot of first hand-help in choosing your activities, dates, lodgings and details for your trip. During the business day there are as many as five of us in the offices - keeping the records straight, the old computers humming and dealing with necessary minutiae. Since our offices are in the former railroad hotel that we call home we'll often answer the phone or email at night or weekends - call when the spirit moves you. 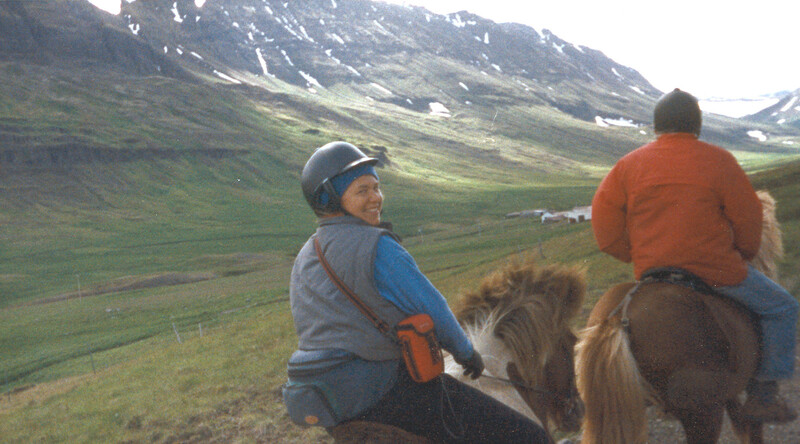 We rode these two horses on several different tours in Iceland and then had them shipped to us in the US. Brekki, in front, and Tinna.